WASHINGTON (CNS) -- A group of priests, religious, young immigrants and their supporters gathered outside of the U.S. Capitol on Feb. 6 to pray for the Dreamers, whose lives are in limbo, and for the legislators who have the power to change their situation. "We've done everything else ... now we pray," said Sister Mary Ellen Lacy, a Daughter of Charity, noting the many marches and protests that have taken place over the past months. "It really is in God's hands at this point." The prayer service was sponsored by several Catholic organizations, including the Catholic Legal Immigration Network Inc., the Daughters of Charity of St. Vincent de Paul, the Columban Center for Advocacy and Outreach, Network, the Sisters of Mercy, the Sisters of the Good Shepherd, Pax Christi USA, the DREAM Project, the Society of the Sacred Heart, the Franciscan Action Network and the Ignatian Solidarity Network. 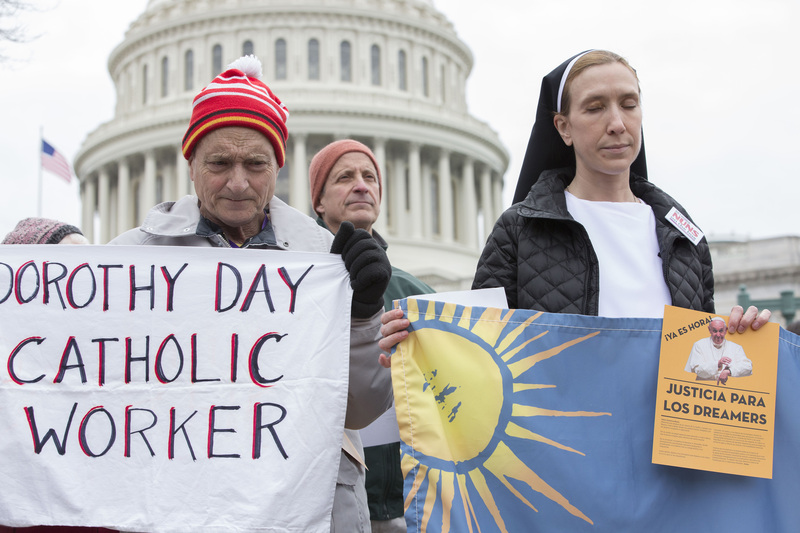 Members of many of those organizations were on Capitol Hill as a part of the final day of the Feb. 3-6 Catholic Social Ministry Gathering in Washington. During that conference, they discussed social issues of importance to the Catholic Church and were meeting with their representatives Feb. 6 to advocate for these issues. As participants in the prayer service gathered in front of the U.S. Capitol on a cold afternoon, Sister Mary Ellen thanked everyone there for "sacrificing your comfort because other people have been forced to sacrifice (theirs)." Following an opening song and Scripture readings, the group prayed the sorrowful mysteries of the rosary. Each decade began with a reflection on the suffering of Dreamers -- young immigrants brought as minors by their parents into the United States without legal permission. Each decade began with a reflection on the suffering of Dreamers -- young immigrants brought as minors by their parents into the United States without legal permission. Many of them have been protected from deportation under the Deferred Action for Childhood Arrivals program, or DACA, created in 2012 by then-President Barack Obama via executive order. Now the DACA recipients face an uncertain fate because the program is scheduled to end March 5, unless Congress acts to keep it in place. During the third sorrowful mystery, the crowning with thorns, the crowd reflected on how Jesus' captors did not find torturing him to be enough, but also needed to humiliate him with a crown of thorns. Similarly, stereotypes and other verbal abuses are the thorns that harm and humiliate Dreamers in the midst of this time of uncertainty, the reflection said. "The burden of carrying the cross was so great that without the help of Simon of Cyrene, Jesus would have been crushed," read the reflection for the fourth sorrowful mystery. "Often Dreamers bear crushing guilt," because they survived the journey, while members of their family didn't, it continued, concluding with a request for "the grace to help them carry the burden." For the fifth sorrowful mystery, the crucifixion, Maria Jose, a Dreamer from Sacramento, California, read the reflection, saying: "We DACA recipients also cried when DACA, our ticket to safety, ended." At the conclusion of the rosary, the group prayed for petitions, with the response, "We welcome you Jesus." "We see you today … in the Dreamers fearing the loss of the only home they've known ... in the legislators who struggle to make the right decisions," the group prayed. "Help us to recognize that whenever we welcome the stranger, we welcome you." Congressman Juan Vargas, D-California, joined in the prayer service as a fellow Catholic. "It is beautiful to ask Mary to intercede today, not only for the Dreamers, but for their parents too," he said, urging everyone to pray for House Speaker Paul Ryan, R-Wisconsin, who also is Catholic. Vargas said he thinks there would be enough votes to pass a DREAM Act if it got on the floor in the House. The Development, Relief and Education for Alien Minors Act, or DREAM Act, would keep DACA in place. "There are good people on both sides who want to protect these young people and their families," said Vargas. For Maria Jose, a 21-year-old college student who came to the U.S. from Peru when she was 4, it was encouraging to see so many people come together to support her and other Dreamers. She was especially thankful for those participating who are not personally affected by any DACA-related legislation. "It brings me a lot of joy to see there are so many people with us," she said.